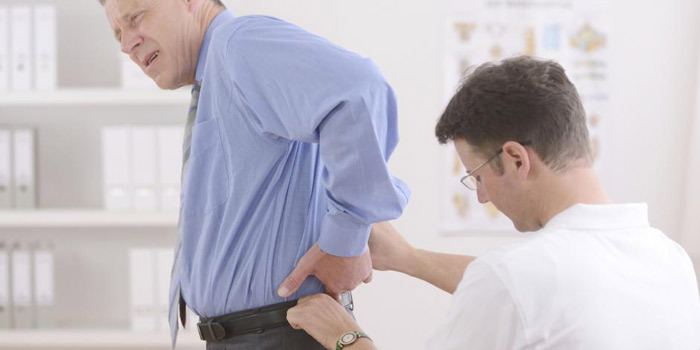 Degenerative disc disease is caused by a degenerative disc in the spine. This can cause symptoms of pain, weakness, or numbness as a result of this disease. This damaged disc produces pain, and the degeneration of the disc is a natural part of aging. Pain stems from two factors: inflammation and abnormal micromotion instability. Inflammation comes from the proteins contained in the disc space, while abnormal micromotion instability refers to the outer rings of the intervertebral disc wearing down. This makes it difficult to resist motion in the spine. Symptoms are consistent with those suffering from lower back pain or neck pain. These symptoms include pain caused by flare ups, severe episodes of back or neck pain, and difficulty bending, lifting, and twisting. The amount of chronic pain a patient experiences varies between individuals and can range from minimal pain to severe and disabling pain. Back and neck pain can last anywhere between a few days to a few months, depending on the severity of the condition. Certain positions make pain worse, such as when sitting in comparison to standing. Patients tend to feel better when they change positions on a frequent basis. It also helps when they are lying down or in a reclining position as these positions relieve stress on their lumbar disc space. When treating degenerative disc disease, goals for treatment include a combination of pain control, exercise and rehabilitation, and lifestyle modifications. When controlling pain, instability and inflammation should be addressed as these are the main causes of pain. For many patients, surgery is not necessary as there are many other approaches including medication and self-care. A trial and error approach may be used to find which treatments work best for each particular patient. With regards to exercise and rehabilitation, the goals are to heal the back and prevent pain from reoccurring. It is best to consult a physical therapist or any other trained healthcare professional to pick the exercise and rehabilitation plan that best suits your specific needs. Lastly, lifestyle modification refers to helping a patient develop a healthier lifestyle. This can include avoiding nicotine, limiting one’s alcohol intake, drinking lots of water, and stretching to help cope with their lower back pain. A walking impairment means that it must take an inordinate amount of time to walk, even with appropriate therapy, medication, and devices. These devises include canes and walkers for example. To be considered as markedly restricted, you must have difficulties walking 100 metres. It may take a great deal of time to do so as a result of pain. Patients with degenerative disc disease suffer from mobility issues as they are in extreme pain and are in discomfort when standing upright. How To Apply for Disability Tax Credit for Degenerative Disc Disease?